Last week, Marvel sacked Chuck Wendig from two of their Star Wars books for—in his own words—“being political and vulgar” on Twitter. The internet has had a lot to say about it. Although the writer has urged his followers not to worry, since comics represent a small part of his body of work, he’s had no shortage of support from the geek community. Beyond fan sites like Making Star Wars and Tosche Station offering their encouragement, Doctor Strange co-screenwriter C. Robert Cargill and Vision comic writer Chelsea Cain are among the industry figures who have rallied behind him. Unfortunately, there’s still a contingent of fans that haven’t been so kind. 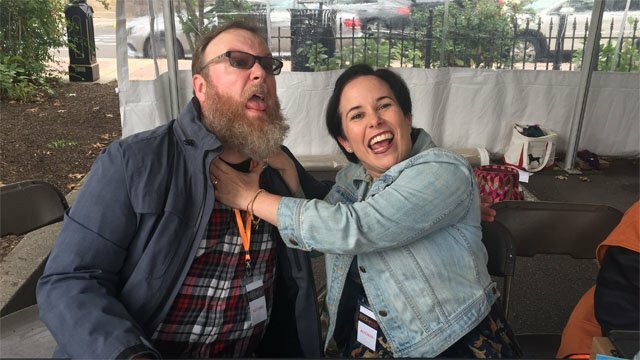 Over the weekend, Wendig appeared at the inaugural Bucks County Book Festival in Doylestown, Pennsylvania for a sci-fi/fantasy panel alongside fellow author Fran Wilde (pictured choking him above). Wendig and Wilde, both Pennsylvania natives, discussed a variety of topics, including how fantasy writers can find success outside the genre once they’ve been pigeonholed by their audience as well as whether the concept of “genre fiction” still has any real meaning. When his firing came up, Wendig used the opportunity to expound on the dark side of social media that’s played a role in his life over the last three years. Wendig’s newest effort, The Raptor & the Wren—the latest in his series of Miriam Black novels—is available now, with the follow-up scheduled for release in 2019. 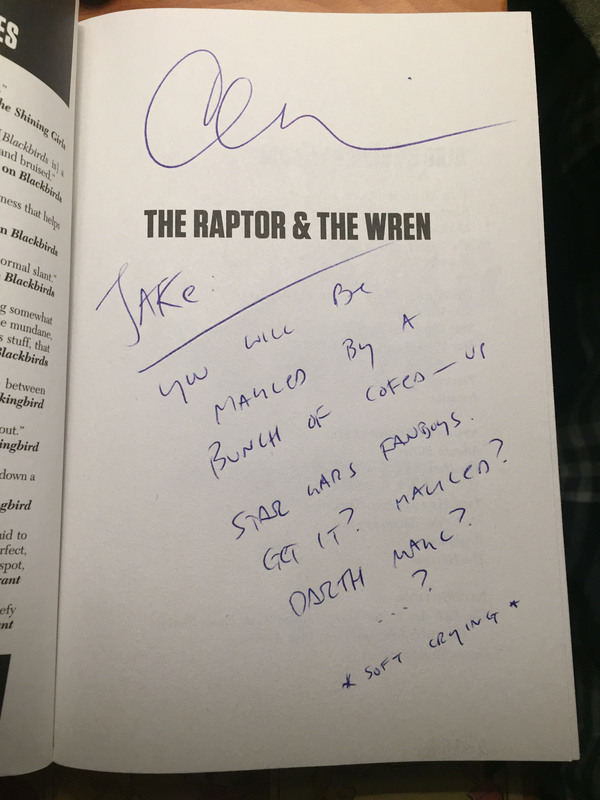 If you’re lucky enough to attend one of his signings, he’ll gladly write his prediction of your demise on the book’s title page. You can check out what he foresaw about my death below, and let us know what you think of his remarks in the comment section.